As you can see, CLASSIC is essentially just an outline tracing of the type. 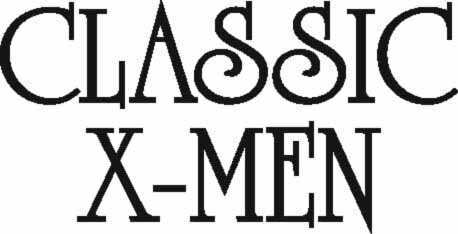 X-MEN has more craft to it, with the wider strokes made much wider, the proportions adjusted for that, and the word put into the same perspective as the Jim Steranko logo, with a drop shadow. I don’t know who did this one, but it’s a nice change for the team. I might have angled CLASSIC to match X-MEN, but really, it looks fine this way. 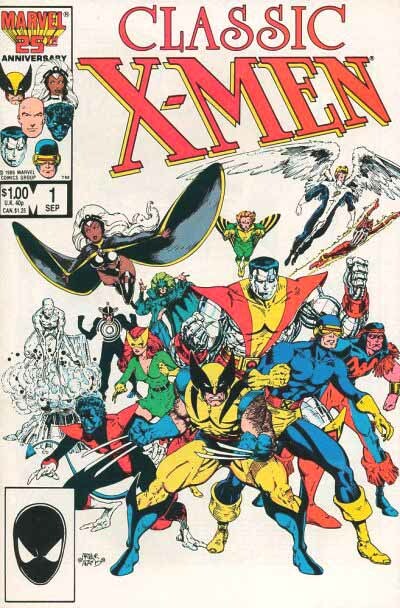 Later the word CLASSIC moved below X-MEN, so that the book would be shelved with all the other X-books. Also in 1986, this team spinoff book debuted. X-Factor was actually the original X-Men team from 1963, plus some new trainees. I haven’t been able to identify the logo designer, but it looks to me like either Gaspar Saladino or Jim Novak. I’ve been in touch with Jim, but I think I forgot to ask him about this one, so I may have an update at some point. Two important things to point out about this attractive logo. This is the first use of a circle behind the X, echoing the belt symbol on the 1963 first X-Men cover. Also, the X has regained its prominence, being by far the largest letter, as in the original X-Men logo. Notice that one diagonal is much longer than the other, running off the page, an effective design idea to my eye. The letters are attractive and readable. The only thing I don’t really like is the extension on the R running off to the right. I would have continued that leg of the R down at an angle, to echo the X. But in all, it’s a good job, and I like the way the drop shadow is handled, too. This logo only remained on the book for ten issues, though. With issue 11, a new creative team of writer Louise Simonson and artist Walter Simonson came on board, and they wanted a new look for the logo. They asked designer Alex Jay to submit some ideas. Here are Alex’s sketches. And here are some of Alex’s notes from the time. 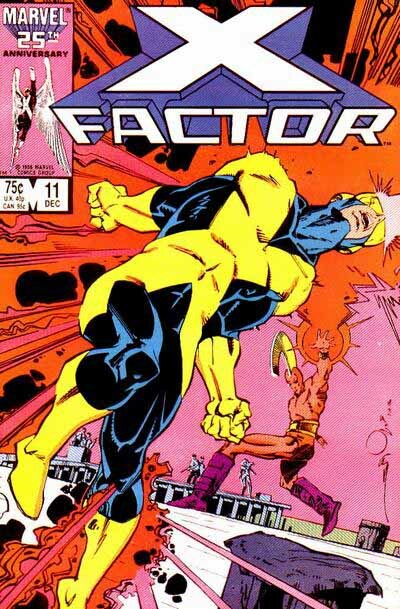 On April 25, 1986 Walt Simonson called to say that he would be drawing X-Factor. He asked me if I would be interested in reworking the X-Factor logo. I accepted. We met for lunch on April 29. Walt liked the current logo but wanted it to be bolder. I agreed to modify the current logo but would explore other designs. On May 23 I showed sketches 1 and 1A that followed his directions: bolder letters that touched each other. He liked them but then I showed sketches 2 and 2A. He paused for a long time, looking back and forth at the sketches. Then he asked Louise what she thought. I don’t recall what was said but their decision was to go with the new design, sketch 2. I started working out the details. The challenge was figuring out the letterspace in the word “Factor” as it projected from the bottom of the “X”. Sketch 3 was very close to the final version; the “C” and “T” would be joined at the top to eliminate the perspective lines. On June 2 I showed a tight pencil rendering to Walt. The finished art was delivered to him on June 6. 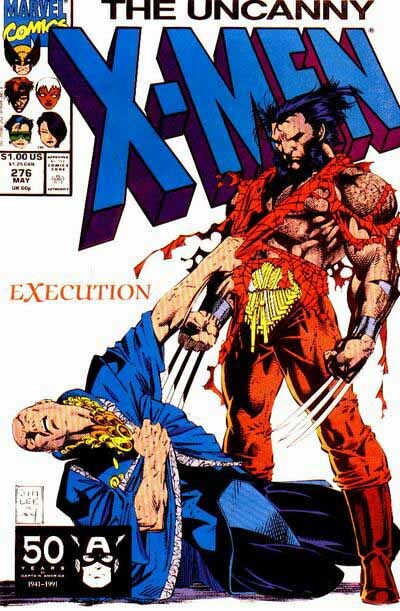 I believe this design for X-Factor was the first, of any “X-” series, to feature the letter “X” without the hyphen. This is a tricky and clever 3-D design by Alex, combining telescoping in two directions. It creates some odd vertical facets in places, but the overall effect is quite attractive. Not only did it lose the hyphen, this logo was the first to put a huge X above the rest of the letters, a great selling point for the franchise. The only thing I would say on the negative side is that the odd telescoping made it difficult to color in a way that made the telescoping reflect lighting changes, so it usually needed to be all the same color. It’s still very three-dimensional, jutting forward off the page. 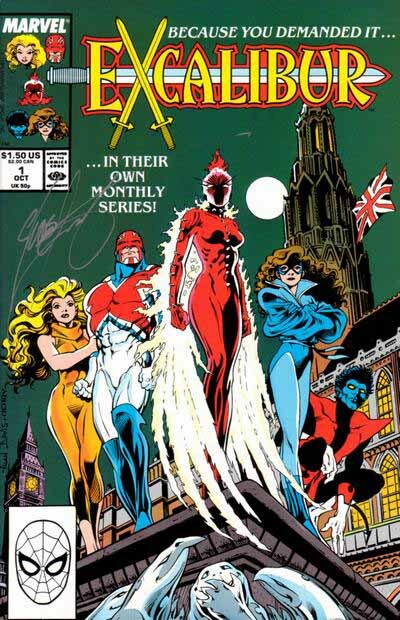 The next spinoff team was Excalibur, which debuted in a graphic novel in 1987, then in their own monthly book in 1988. Writer Chris Claremont and artist Alan Davis combined X-Men characters with those from another series, Captain Britain, to form this team, whose adventures took place mostly in England. Again I haven’t been able to discover the designer of the logo, though I strongly suspect it was the artist, Alan Davis. The use of three well-drawn swords, and the unusual rounded, almost bouncy letters, don’t look like anything being done by the logo designers working at Marvel at the time, as far as I’ve been able to find out. I haven’t been able to contact Alan to see if I’m right, but I’ll add an update if and when I do. As for style, the swords are attractive, the letters are easy to read, though a bit thin in places. The outline all around helps hold it together and apart from any cover art, but it’s kind of odd that the outline is missing around the crossed swords. That would have helped it read as an X. Still, perfectly fine for the book, and it lasted for several years. Not much changed from 1988 to 1991. All the X-books were selling well. Occasionally UNCANNY varied their logo a bit, as in this super-stretched version, even taller than the Steranko original. As the nineties began, comics were booming, sales were up across the board, and it was time for more new X-titles to hit the stores. We’ll cover some of them in part 5. This entry was posted in Logo Studies on October 6, 2007 by Todd. I very much doubt that Alan designed that EXCALIBUR logo — Terry Kavanagh would know. 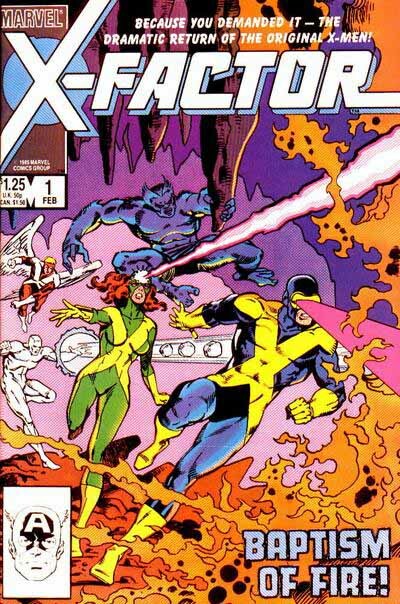 Nice to finally know who did that awesome 3-D X-Factor logo…one of my favorite X-related ones! the original X-Factor logo will always strike me as innovative, where most others are graphic (and dynamic). the best feature being the X laid over the sided panel – to that point i wouldve scaled the -factor back to center stage, to highlight that. and the R doesnt bother as is, but with the scaling, the lengthened stretch would have to go. the dash too, would have to be scaled and half/half’ed along the edge of the circle – which most definitely would stay. not that im in the business.. just a fanboy-esq, quasi-collaboration / think tanking. blerg.. forgot to mention the notches working in the A, and O not working for me. that might be what wouldve made me pull the logo after 10 issues – to empathize with the change. i wouldnt have minded something to match the F’s notch, and maybe worked into the R.